Did I mention the cover is also really cool looking? I have embarked on a quest to read through the Star Wars Expanded Universe once more, and here I begin my quest with Darth Plagueis by James Luceno. There will be SPOILERS in this review. Darth Plagueis is ostensibly the story of Emperor Palpatine’s Sith Master, but it is much more than that. It also provides extensive background into the person of Palpatine/Darth Sidious and his own rise to power. Moreover, there is much background provided herein to show the development of plot details behind the Prequel Movie trilogy. 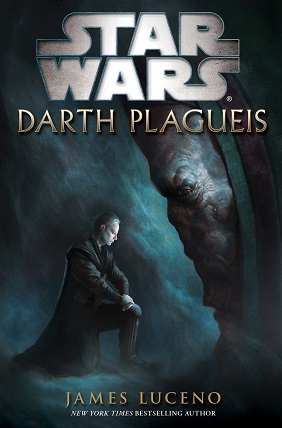 The book begins by tracing Plagueis’ own overthrow of his master and his eliminating all Sith opposition in order to cover his tracks. He encounters Palpatine on Naboo and ultimately convinces him to join the path of the Sith. Plagueis wishes to overthrow Darth Bane’s “Rule of Two” which teaches, among other things, that apprentices should always be looking for a way to kill their Sith Masters in order to perpetuate strength in the order. He also seeks to destroy the Jedi and forge the Republic into a creation of the Sith. As Plagueis and his apprentice, Sidious (Palpatine) work towards these ends, Luceno also traces developments in the wider galaxy, particularly in the growing conflict between the Trade Federation and Naboo. The details of this development actually serve to make more sense of various things found in the Prequel Trilogy such as why the Trade Federation would work with Sidious, how Amidala rose to the throne, and more. One downside is Plagueis’ focus on “midi-chlorians,” a concept I’ve been trying to forget since Lucas brought it into Episode I. Another issue is that, past the first half of the book, it becomes almost entirely about Palpatine rather than Plagueis. This isn’t necessarily a bad thing as it maintains a coherent story throughout, but I thought it worth mentioning. The book therefore provides a decades-long development of the work of the Sith alongside the broader developments in the galaxy. This could be a recipe for disaster, but Luceno pulls it off remarkably well. He also interweaves questions of morality, political control, and other philosophical issues into the plot. The book is fantastic. 114D immediately calling Sidious master after Sidious had killed Plagueis. Droid don’t care. Darth Plagueis is a really awesome entry into the Star Wars universe; it is one which actually succeeds in deadening some of the awfulness of the Prequel Trilogy while also standing on its own two feet. It’s not a perfect book, which suggests an “A+” is too high, but any book that manages to accomplish the Prequel redemption and avoid the serious possible pitfalls gets mad bonus points. I’m excited that so many recommended it to me and that I finally got around to reading it. I would highly recommend a read-through for Star Wars fans. Please let me know if you have any ideas for categories I should include in these reviews going forward. Reginald Barclay is a “Joe Schmo” engineer on board the Enterprise who is a klutz. He’s always late for everything (except for every meal? ), he messes up on the job, he’s socially awkward. No one likes him. Picard, however, decides that Geordi (among others) must make an effort to integrate Barclay into the crew. This turns out to be harder than everyone may realize as Barclay’s social awkwardness comes to the forefront. Moreover, a series of problems occurs aboard the Enterprise which leaves everyone on the brink of destruction. Barclay and crew attempt to figure out what is wrong, and Barclay ultimately figures it out with a rather unorthodox suggestion right in the nick of time. It is a testament to a show like TNG when it can make episodes about sub-characters which are even a bit compelling. “Hollow Pursuits” is really quite interesting as it reminds viewers that everyone has struggles, even in the sometimes pristine perfection of the future in Trek. And, really, as a viewer you have to feel sorry for Barclay. As mentioned above, he’s got a lot of problems. He even has a nickname, “Broccoli,” from Wesley Crusher. Seriously!? Low blow! I wanted to give this episode a higher score, but I just found the main characters acting so out of character that it became really quite bothersome at points. Picard orders Geordi to become Barclay’s best friend? Really? I’m not surprised that the Captain would want his crew to make every effort for individuals, but Picard’s character also seems like one that demands the absolute best out of his crew, and when one is continually not hitting the grade reports of everyone else, there may just be a weakest link. Troi’s own behavior as counselor was unacceptable in a number of places, particularly her insistence that they intrude on Barclay’s private mental life on the holodeck. Of course, all of these out-of-character moments are intended to make us relate more to poor ole Barclay, and at times they do work. The problem is that they are just so unbelievable it makes it difficult to buy into the episode as much as one like this needs you to in order to get the most out of it. It’s a solid premise with poor execution. Data is captured by Mr. Fajo, a man who collects rare objects, and coerced into becoming part of his collection. As Data resists, Fajo ups the ante and threatens lives of others in order to get Data to comply. Meanwhile, the Enterprise, thinking Data dead, rushes off to help a colony deal with a water problem. The crew of the ship realizes that the facts are just a bit too convenient and head off looking for Data. Data attempts an escape which leads to his partner’s death by Fajo’s hand, and the Enterprise rushes back to save the day, but not before Data made a hard choice to kill Fajo which was only interrupted by the transporter. Here’s an episode that has stuck with me throughout time. I’ve always remembered this one, because there is such a feeling of wrongness about it. When I was younger, I was enthralled by the cool idea of a guy who traveled around the galaxy trying to build up the greatest collection of interesting things, and as I got older I realized there was more complexity to this issue than meets the eye. Once more, viewers are forced to consider the question of whether Data is property or a person. In the back of our minds, having watched the show straight through to this point, episodes like “The Offspring” or “The Measure of a Man” spring to mind to point us in the direction of thinking that Data is a person and this whole thing is one awful mistake. Fajo’s character sells this episode big time. He is nefarious, greedy, but also very thoughtful. He just wants “the most toys.” Is that too much to ask? Data insists it is and even comes to the tipping point where he makes a calculating–not enraged–decision to kill Fajo to prevent the cycle from continuing. It’s an epic moment f or Data’s character, as the viewers know it is not a decision based on emotion. This theme is reiterated when Fajo–his life spared only because Data was transported mid-firing–is confronted by Data who points out that it does not bring him pleasure to see Fajo contained. Yet as the credits begin to roll and Fajo is shown still standing in his cell, viewers are left with the distinct impression that Data, not Fajo, is the moral being. It’s a great point, and another poignant moment in an increasingly awesome season. The only real problem with this episode is that it does drag on at points. The juxtaposition of the race to save a planet’s water supply with Data’s own struggle was solid, but it also made the episode feel a bit elongated. 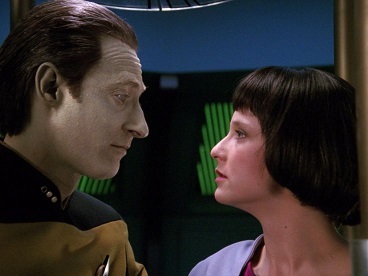 Many of the scenes on the Enterprise felt like filler, particularly because of the great drama in the scenes with Data. I downgraded it a bit because of this, but really this has always been an episode I enjoyed quite a bit. It’s a great premise with lots of moments of excitement. I give it an “A” in the enjoyability category, but stick with my final overall grade. 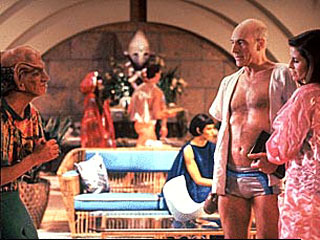 Picard’s outfit in “Holiday” leads to images which will never be forgotten…. Picard is convinced to take a vacation and he goes to Risa, a luxurious vacation planet (apparently?) to take some time by the beach/pool and read some lengthy books. Life has different plans for Picard and he encounters Vash, an archaeologist who is being pursued by a Ferengi and trying to find the Tox Uthat (hereafter TU), a weapon from the future. Meanwhile time-travelers are also pursuing the weapon. Picard and Vash team up and go to find the TU but after encounters with the future-peeps and Ferengi fail to find it. Ultimately, Vash is confronted by Picard and is forced to reveal she already had the TU, which Picard destroys to the chagrin of all. Look, this episode is like a lost Indiana Jones movie (a good one, not one of the even ones) with Patrick Steward as the lead playing Jean-Luc Picard. Need I say more? No? Well I’m going to anyway. This is one fun episode. The beginning of the episode is great, as a conspiracy to get Picard to take a vacation unfolds. Riker encourages Picard to go to Risa for the women, resulting in this funny exchange: Riker: “Have I mentioned how imaginative the Risian women are, sir?” Troi: “Too often, Commander.” Dr. Crusher asks Picard to give his own prognosis and cure: vacation. Troi mentions her mother might be stopping by (DISCLAIMER: LWAXANA TROI IS NOT IN THIS EPISODE!). Picard ultimately must give in. But the fun only gets started in the introductory scenes, as the premise of Picard taking the role of Indiana Jones and going off on an adventure to find a lost future weapon is just fantastic. Maybe it is my inner archaeologist speaking, but I love that Picard is into archaeology, and to finally have an episode feature this aspect of his character rather than just use it as an explanation for how he knows something is great. The episode has many twists and turns which are at times a little over-the-top but in general are, I think, delightful. It’s like a pulp adventure translated to television, and it just works. This ranks among my most-enjoyed, and it gets there through its tongue-in-cheek narrative and winking the whole time while also showing off Picard’s character more than he has been in a while. Also, on a side note, I think this was my biggest score-difference with my wife in an episode yet. A strange living ship has been discovered and the Enterprise must race Romulans to reach it. The Enterprise is also acting as diplomat transport to bring Tam Elbrun, a Betazoid with powerful empathic abilities, to try to communicate with the ship. Ultimately, Tam goes aboard the ship and stays, finally finding peace from his empathic dissonance. Here’s an episode that makes a dramatic turnaround. When viewers first encounter Tam, it seems we’re about to get another obnoxious character episode that–at least in the past–leads to some half-hearted attempt to garner sympathy. Here, however, Tam’s character experiences genuine development. Troi and Tam have a past, and their discussions about empathic ability adds great depth to both characters without seeming contrived. Tam is well-acted and he is able to make the character feel real in developing through the episode. The Data/Tam sub-plot is also great, as Data’s lack of feelings means Tam cannot sense him, which ironically makes Data the ideal companion for a man constantly haunted by the minds of others. It is a great dynamic to add to the episode. Having Data round it off by pointing out that he “belongs” on the Enterprise is a fitting end to an episode about finding one’s place in the universe. I have read almost every book in the Star Wars Expanded Universe that takes place post-movies. With the sun setting on the EU and rising on a new series of “canon” novels, I’ve had a hankering to go back to the beginning (Princess Bride reference, anyone?) and re-read a number of the books in the series. So I’m going to. I think I’ll actually start with Darth Pelagius because it’s been recommended by a large number of people, and then dive in at the place I started so long ago: The Courtship of Princess Leia. Yes, I will be writing reviews of each book along the way, so if you want to follow/read along, you’ll be able to. These posts won’t be going up at any specific or regular times so just be aware of that. I may or may not skip the X-Wing series because I don’t own them all. Let me know what you think of this as a possibility and if there are any specific things you’d like to have me mention in a review. I want these to be fun and not just reviews, so categories like ‘Best Droid Moment’ might become a reality. Darth Plagueis by James Luceno– Recommended by numerous friends, I finally got around to reading this book on Palpatine’s past. Is it worth recommending? The Courtship of Princess Leia by Dave Wolverton– The first Star Wars book I ever read. Does it hold up, or was nostalgia the only reason I enjoyed it? Heir to the Empire by Timothy Zahn– The Thrawn Trilogy gets underway. Is it deserving of its fame? Dark Force Rising by Timothy Zahn– Book 2 of the Thrawn Trilogy. Does it continue to succeed? The Last Command by Timothy Zahn– The conclusion of the Thrawn Trilogy. Will my fond childhood memories be shattered, or will the book hold up after 20 years? The Paradise Snare by A.C. Crispin– The Han Solo Trilogy starts off with The Paradise Snare. Is it worth finding out Han Solo’s origins? The Hutt Gambit by A.C. Crispin– The second book of the Han Solo Trilogy. How does the famous scoundrel hold up in this prequel book? Rebel Dawn by A.C. Crispin– The Han Solo Trilogy concludes with a book that brings Han and Chewbacca all the way up to the events of “A New Hope.” Can it stand up to the rest of the trilogy? Tales of the Bounty Hunters edited by Kevin J. Anderson– A collection of short stories about those bounty hunters encountered in The Empire Strikes Back. Darth Bane: Path of Destruction by Drew Karpyshyn- The Darth Bane trilogy came to me highly recommended. It deserves accolades. Darth Bane: Rule of Two by Drew Karpyshyn– More exploration of the background of the Sith long before the Star Wars movies, and it’s well worth your time. Darth Bane: Dynasty of Evil by Drew Karpyshyn– The conclusion of the fantastic Darth Bane trilogy proves the whole series can stand on its own. Star Wars: Labyrinth of Evil by James Luceno– A prequel book to Episode III purports to fill in some blanks in how Anakin became Vader. Star Wars: Revenge of the Sith by Matthew Stover– the novelization of the film does some work in making the movie seem not so disappointing. Jedi Search by Kevin J. Anderson– The first book in the Jedi Academy series seeks to establish some new enemies and main characters. 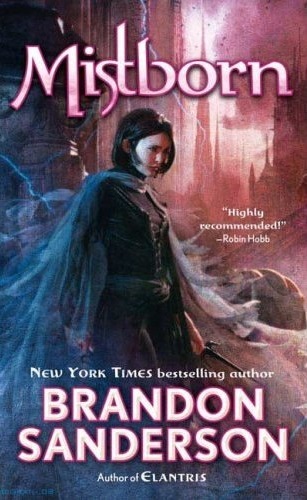 Dark Apprentice by Kevin J. Anderson– The second book in the Jedi Academy series–does it manage to cash in on the previous book’s promise? Champions of the Force by Kevin J. Anderson– The conclusion of the Jedi Academy Trilogy seeks to wrap up a number of loose ends, but can it deliver a compelling finale? Nothing like good ol’-fashioned a shaming ceremony to brighten a day. Worf’s father is accused of treason, and his heretofore unknown brother comes to ask Worf to defend against this charge. 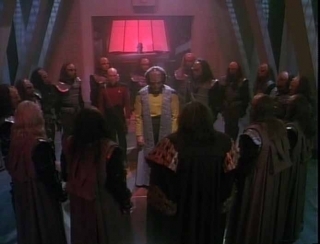 Unfortunately, it turns out the whole thing is a political move as a prominent family was really the one guilty of treason, but Worf’s family is smaller and the Klingon hierarchy thought he wouldn’t care. The secret is discovered, but Worf agrees to suffer the dishonor of shunning in order to both allow for the political out and give himself time to discover a way to bring the truth to light. There is an enormous amount of development which happens in a small space in this episode, but it balances everything so well that it just adds to the greatness of viewing it. Unfortunately, it does mean my plot summary above is inadequate. There are many scenes I simply skipped entirely, and many of these directly impact the story. It’s a testament to how great this episode is that it feels like we as viewers have suddenly been exposed to how enormous the universe really is and how different things are happening beyond the Enterprise. I just want to highlight some awesome points for the sake of keeping this readable. The exposure to more of Klingon culture is done in a believable fashion, as we discover more major cultural differences between the Federation and the Klingon Empire. By exploring these issues directly through Worf and Picard, the episode is able to make it more intense while also grounding it in familiar enough territory that we never feel lost. The mystery as the crew tries to track down what really happened on Khitomer is balanced well with Worf/Picard/Kurn’s own investigations on the surface. Making Picard Worf’s second is as believable as it is awesome, and it gives a sense of how Worf has been integrated into the crew of the Enterprise. The large variety of sets and the exposure to the Klingon homeworld make the episode feel even larger than it is. By introducing us to a new center around which to operate, “Sins” both widens the galaxy and makes it seem less like random wanderings through disconnected places. Worf’s brother provides both comedy and added drama, particularly in the early part of the episode while he’s not yet revealed himself. Finally, there’s the shocking ending. I don’t think anyone really expects Worf to take the fall when they first see this one, but to have Worf accept massive dishonor–when honor is clearly so important to him as a character–in order to bow his head to the needs of the time is just an ingenious move. It’s both believable and surprising. Here is where Worf really comes into his own, and it shows that TNG is fully capable of carrying episodes with characters other than the central ones. “Sins of the Father” is a reminder of why we watch television, with its intense drama, but it also serves a major reason to watch TNG specifically. It’s one of the all-time great episodes. Picard is kidnapped and put in a room with three other captives while he is replaced by a body double. His double runs around acting strangely while Picard tries to coordinate with the other captives to escape. Ultimately, it turns out that he is just part of an experiment by a more advanced species wanting to explore the concept of leadership. Picard and crew are able to convince the species what they did should not be repeated. “Allegiance” has some great elements in it, but they never seem to come together. The biggest difficulty with this episode is that it doesn’t do enough with the drama it could have generated. Body-double-Picard is so clearly not Picard that the crew immediately notices it. All the intensity that could have been built up is thus drained because everyone, not just the viewer, knows something is up. The hostages back in the inescapable room keep some of the drama going, and the greatly different characters give some interest, but again the mystery just doesn’t seem to be there. It’s not a terrible episode, and it the premise is really interesting. After all, with all the godlike beings out there, at some point you’re going to run into some weird experiments with seemingly inexplicable goals. But the drama just doesn’t build like it needs to to keep viewers engaged. The Enterprise crew unwittingly stumbles into a time rift which sets in motion an alternative future in which war has persisted with the Klingons for many years. The only one who notices anything is different is Guinan, who tries to figure out how to revert things to the past. Meanwhile, the future-Enterprise encounters a ship from its own parallel past, the Enterprise C. It seems that because C came to the future through a time rift as well which has disrupted this future because the C would have fought Romulans and perhaps prevented this long war. Ultimately, the C is sent back to its doom, along with Tasha Yar who will die in the line of duty instead of senselessly being murdered. It’s a convoluted plot, and I apologize for having to take so long to explain it, but it is a good one! The sense of wrongness about seeing the Enterprise as a warship instead of a vessel of exploration is exacerbated by having Tasha Yar in the flesh once more. Guinan knows something is wrong, and of course the viewer knows it too, but the way it develops unfolds a mystery that is both fun and compelling. Showing off the alternative-future Enterprise is a lot of fun, and it is also interesting to see how the war with the Klingons may have developed had peace not instead been reached. It is particularly surreal to see the bridge crew armed at all times and watch the Enterprise function as a warship.The explanation of having the C die defending the Klingons (ultimately to no avail! ), thus showing the honorable nature of the Federation to the Klingons is genius and also provides a lot of great background information. The only major downfall of “Yesterday’s Enterprise” is its continued moralizing to the extent that it seems a bit like getting the questions the episode raises rammed down viewers’ throats. Is war okay? Is a death in one fashion better than one which is senseless? Is sacrifice of the few for the many good? Should we mess around with time travel anyway? Etc., etc. I normally like the moral questions TNG raises, but the massive number of questions so intentionally raised and dangled past viewers here was just overdone. Overall a solid episode, but just hampered by too much reflection. This is one that could stood by just having the action continue. Data creates another android he refers to as his child. The android picks gender as a female human and her given name is Lal. Admiral Haftel comes to investigate and argues Lal should be given to Starfleet to raise her, but Data counters that he is the most experienced one to do this task. Data’s creative skill is so good that she surpasses him, and as the Federation tries to decide what to do with her, she short-circuits. Haftel tries to help Data but ultimately she succumbs and she suffers a total failure of her cognitive net. She dies saying that she loves Data and will feel enough love for both of them. I was surprised by how much I enjoyed this one, as I remember in the past being bored by it. Maybe it’s the fact that I have a child on the way (well, by the time this publishes I’ll have a newborn! ), but this hit me right in the gut. It’s an incredibly touching episode made all the more impressive by the fact that it is headlined by the character without feelings, Data. This was a smart choice by the writers as they were able to utilize the emotional roller coaster of the episode to make Data’s own striving for humanity and emotions all the more interesting. The mounting drama between Picard and Haftel over the fate of Lal is done very well. Picard, despite chastising Data for his project (to which Data humorously responds that no other crew members have to discuss their procreation with the Captain), sticks up for his own in a fashion that we have come to expect from him. Having Haftel turn from antagonist and villain to co-operator when trying to save Lal is another genius move as it makes him a more realized character while also adding to the emotional gravity of the moment. Haftel’s description of Data continuing to work despite the fact that hope was being lost was gripping. Really, this episode could be summarized as “All the feels.” An excellent episode, and one which improves upon re-viewing.